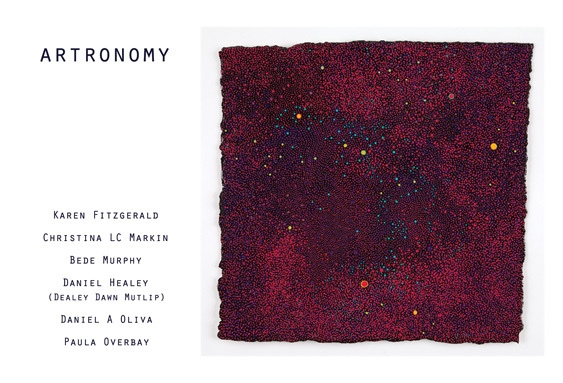 AG Gallery in Williamsburg is pleased to present a group exhibition, “Artronomy” by six emerging artists Karen Fitzgerald, Daniel A Oliva, Christina LC Markin, Paula Overbay, Daniel Healey, and Bede Murphy. The exhibition will evoke dramatic feelings of the outer space and universe, using various mediums to portray the cosmic world. Karen Fitzgerald was born in Wisconsin, and her works has been widely exhibited in the United States. She works in multiple layers on a round panel, producing a deep, rich, luminous surface. Daniel A Oliva is an artist living and working in Philadelphia. His works are often distant images, with the use of paintings and photography. He also explores maps, geology, and climate science for his works as well. Christina LC Markin born in Canada in 1975, Markin immigrated to Australia in 2004, and currently works from her Brunswick studio. She wishes her paintings to be unexpected, rather than reproducing what is already there. Paula Overbay is a New York artist who presents colorist-style abstract paintings. Overbay explores simplicity and symbolism, and her work is mostly consisted of dots and lines. Daniel Healey is an artist and curator from Oakland, CA. Alongside his own he pursues a group work called “DealeyDawkMutlip”, which is a 3 person collaboration with Michael Cutlip and Darren Hawk. Both of his group work and individual work will be displayed in Artronomy. Bede Murphy has been making an endless variety of drawings, paintings, photos and books since 1992. He lives and works in Brooklyn, and is the Creative Director of a gallery in DUMBO.